You’ll need a large, deep baking sheet or two smaller sheets that will fit in your oven at the same time. I use the Wear-Ever half-size aluminum sheet pan. 1. Adjust the oven rack to the lower-middle position and preheat the oven to 350º. 2. 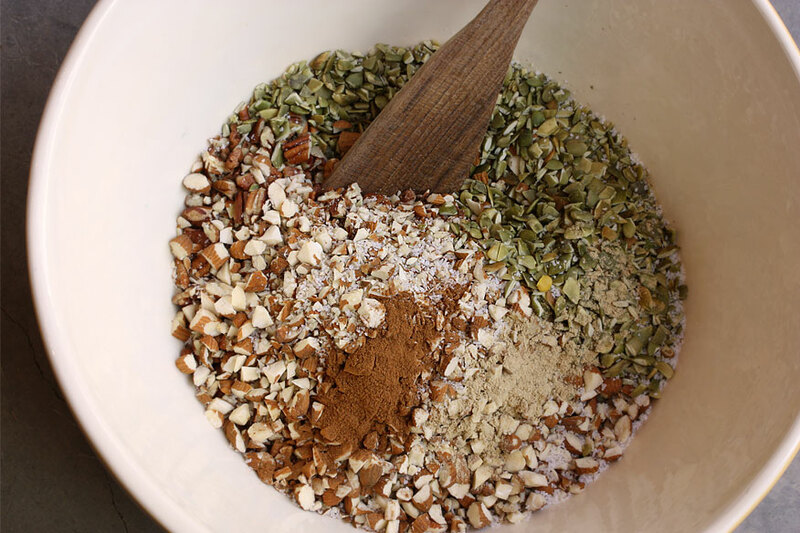 Chop the ¾ cup sesame seeds, 1 ½ cup pecans, 1 cup almonds and ½ cup raw pumpkin seeds to whatever size suits you, then put them in a large mixing bowl. 3. 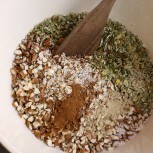 Add the 1 ½ tsp salt, ½ tsp ground ginger and 1 tsp cinnamon to the bowl then stir the ingredients to disperse the spices. 4. Drizzle the 2 tbsp macadamia nut oil on top and stir to mix. 5. Add the ¾ cup maple syrup and stir to mix. 6. Add the 5 cups gluten-free rolled oats and stir well until all of it is coated. 7. Cover a large baking sheet with aluminum foil. Pour in the mixture. 8. Bake for 15 minutes. 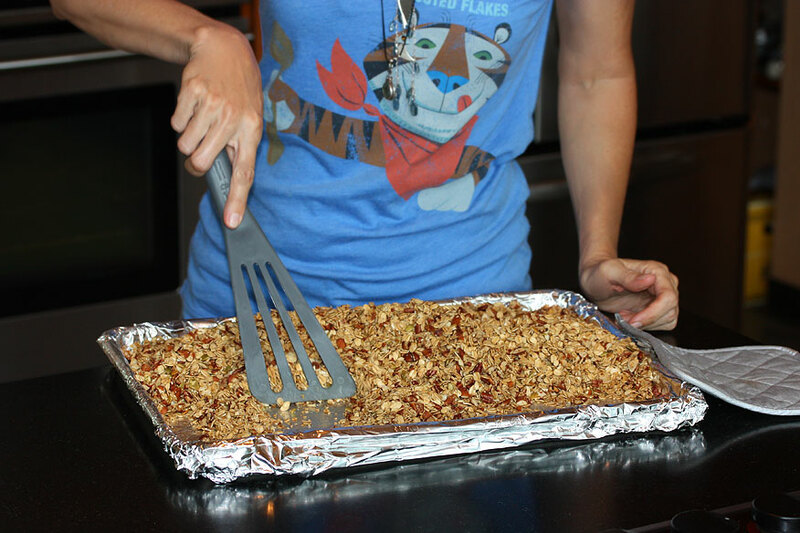 Remove the baking sheet from the oven; using a spatula, carefully scrape granola from the edges and rotate browned granola to avoid overcooking. 9. Place the pan back in the oven and bake for an additional 15 minutes. 10. 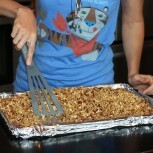 While granola is baking, chop the raisins to half size or smaller and chop dried apples into small chunks. Place in a bowl and cover with plastic wrap. 11. After the second bake, remove granola from the oven and stir. Turn the oven off and put granola back in to dry. (This makes it crispy) Set timer for 5 minutes and check to ensure its NOT continuing to brown. 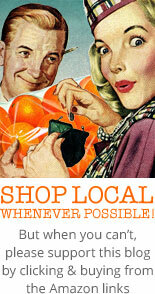 If it is, take it out and let the oven cool for a bit before returning it to the oven. Do not let granola get too dark to avoid burnt texture and flavor. 12. Once cooled to room temperature remove the sheet from the oven and pour it into a large bowl. Add apples and raisins. Storage Info: Keep in a large, well-sealed jar to maintain texture. 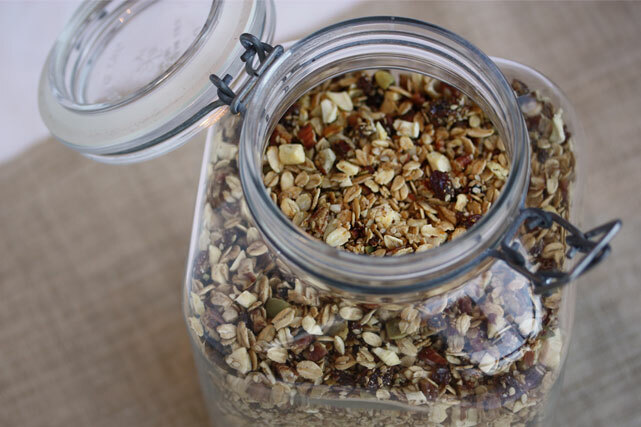 If you intend to use the granola for long term storage, do not add fruit before packaging, or the moisture in the fruit will shorten the shelf life of the granola and dampen its texture. You can chop the fruit and add it when you open the package later. Even without the fruit, the granola still tastes great!